Greece’s crisis exposes Europe’s most important divide: Syriza’s coalition is about integration versus isolation. It isn’t left or right. 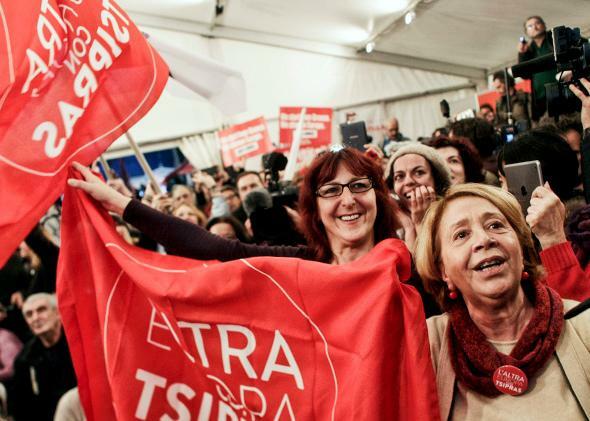 Syriza supporters cheer at exit poll results that indicated that their party had a clear lead on Jan. 25, 2015, in Athens, Greece. For those who want a happy ending or an easy moral to the story, the election of a new Greek government last month poses some interesting quandaries. Progressives of various kinds at first hailed what appeared to be a victory for the radical left-wing party Syriza, but they were caught off guard when Syriza instantly struck a coalition deal with the Independent Greeks, a radical right-wing party that Daniel Cohn-Bendit, a legendary European leftist, bluntly described as “ultranationalist” with a “homophobic, anti-Semitic, racist” leader. Many of those who rooted for Syriza because of its campaign against the budget-cutting “austerity” program imposed on Greece by its creditors were also taken aback when other, more urgent priorities appeared on the new leaders’ agenda. Both parties turn out to have close connections to the authoritarian Russian government, and both have curious links to a notorious Russian fascist ideologue, Alexander Dugin, who among other things has called for a “genocide” of the “race of Ukrainian bastards.” Accordingly, the new Greek government’s first foreign policy act was not a protest against European economic policy but a protest against sanctions on Russia. Only then did it launch negotiations with its European creditors by announcing that it would refuse to negotiate with its European creditors. In truth, Greece makes nonsense out of all of the political categories we normally use in Europe. Our notions of “left” and “right” are ancient, dating to the French Revolution: In 1789, the nobility sat on the right side of the Assemblée Nationale, and the revolutionaries sat on the left. Since then, “people who want change” are supposedly leftist, and “conservatives” are rightist. This typology hasn’t really worked for a long time—there have been plenty of revolutionary right-wing movements and an equal number of conservative leftists. But this language now obscures what is happening in Europe altogether. The most important division in Europe is not right versus left. Nor is the main issue even “austerity” versus “anti-austerity.” Some of the countries hit hardest by the 2009 financial crisis have pursued “austerity” with great success. Ireland has restructured and is once again growing. Latvia found ways to cut government spending without cutting pensions and is growing at one of the fastest rates in Europe. The real division in Europe is between what I would call established, integrationist politics and isolationist, nationalist politics. It was visible last year in Britain, during the Scottish independence referendum. The Scottish Nationalists were unlike Syriza in many, many ways, but they were using similar language of “national renewal,” and they were calling for a similar reassertion of national control: control over the economy, over political decisions, over borders. Syriza gets along well with the Greek far right because, in essence, both want to reassert national control. Perhaps the right would prefer a higher emphasis on immigration, but it shares Syriza’s furious hatred of the troika that control the bailout fund that has been extended to Greece—the European Central Bank, the European Commission, and the International Monetary Fund. Both parties want decisions about Greece to be made inside Greece. Foreigners, especially bankers, should go away and keep their opinions to themselves. As it happens, Russia is now led by a man who voices exactly the same views: Vladimir Putin has also isolated his country, politically and economically, from the rest of Europe. Hence the warmth between him and the Greeks. Emotionally, this view is perhaps understandable. But in practice it is utterly utopian. Yes, it’s true: Greeks democratically elected a government that wants to end “austerity.” But Germany, France, and others also have democratically elected governments, and their citizens do not want to prop up a country that still refuses to carry out structural reforms and cannot collect its own taxes. Nor do they want to pay for a massive run on Greek banks or a huge new wave of capital flight. Greece is not only a part of the European Union and not only part of the common currency eurozone, it is also part of a global trading system whose rules cannot be changed by a single country. There are a number of ways the Greek story might end. Perhaps Syriza and its creditors will find a face-saving compromise. Perhaps Greece will default and leave the eurozone. Only one thing is certain: It will not end with a wave of a magic wand. Huge sums of money will not be conjured out of nowhere to pay Greece’s debt or replenish its budget. No fairy godmother will be found who can fix a financial and bureaucratic mess created by decades of irresponsible policy.